Australian limes are species of the plant genus Citrus that are native to Australia. They have been used as a food source by indigenous Australians as well as early settlers and are used in modern Australian cuisine, including marmalade and sauces. 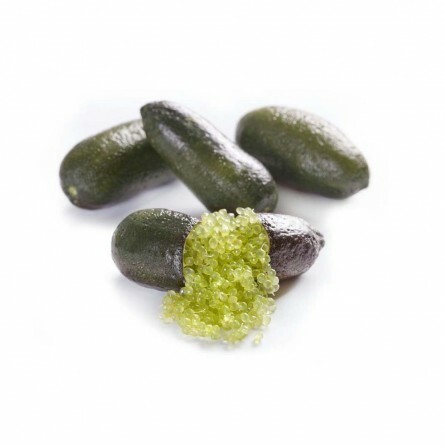 In particular, the finger limes are species from rainforest regions of northern New South Wales and Southern Queensland with elongated yellow-green to purple fruits. The particularity of this Lime finger-shaped (with a length of between 10 and 17 cm and a weight of 25-30 grams), not particularly attractive from the outside, is in the pulp of the fruits, constituted by a set of individual vesicles juicy resembling caviar in size and consistency. The color of the pulp depends on the variety and ranges from opaque pink, lime green to yellow and red to vibrant burgundy. When you bite the pulp of a "finger lime", the vesicles almost explode in your mouth, releasing their particular sour taste. Highly decorative, the "citrus caviar" is proposed as an ingredient in food preparation, both simple and complex and has the potential to become a "must" in the restaurant industry. Ottimo sul salmone selvaggio affumicato !